Termites are tiny critters that can be intimidating. They are intimidating because they are difficult to detect. They are easily misidentified with ants. Considering that ants and termites are the same size. The best way to distinct a termite is by looking closely to the antennas. Ant’s antenna’s have bent, elbow antennas. Whereas a termite’s antennae is straight. Call Varsity Termite and Pest Control today to conduct a termite inspection in your home. Are termites wreaking havoc on your home? Do you need a quick solution? For termite inspections and treatment in Glendale, come to Varsity Termite & Pest Control. Offering free termite inspections, we can determine the extent if the termite damage and get those troublesome pests taken care of. As an accredited business on the Better Business Bureau, Varsity Termite & Pest Control is screened and approved by Home Advisor and has 99% five star reviews on Yelp. Get your termite problem under control with Termite inspections and treatment by Varsity termite & Pest Control. For more information, give us a call at 602-560-6021 or visit our website at VarsityTermiteAndPestControl.com. Our Glendale termite exterminators are qualified to identify and manage a termite infestation. A termite infestation is a complex infestation that needs to be addressed accordingly. Varsity’s termite exterminators have a proven track record and are termite certified technicians. Our exterminators are the best in the city of Glendale. Have our well qualified exterminators conduct a free termite inspection to determine the best course of action. There are several thousands of species of termites, and only 10% of them are considered pests as such and warrant a call to your local Glendale exterminator. Ecologically, termites are important for recycling nutrients, creating habitats, forming quality soil, and as a food source for predatory creatures. Termites are detrivores, meaning that they feed on debris and recycle decomposing materials as nutrients that enrich the soil. Termites that build nests near your home, however, are something else entirely. A Termite Control Inspection Should Be Performed Annually in Glendale. A termite inspection carried out by a qualified Glendale termite control service can allow you to stop a problem before it becomes an even bigger problem. Don’t be fooled, Even though, they’re not very big, termites can and do cause structural damage. Their sheer numbers, well into the millions per nest, plus their diet is what can cause concern among home and business owners. 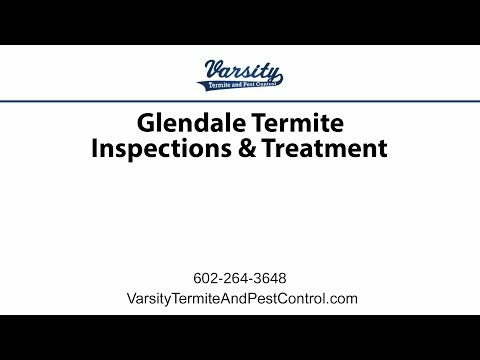 Varsity Termite and Pest Control provides convenient, local protection in Glendale, Arizona. Contact Varsity Termite and Pest Control to take care of the situation. Having one of our professional exterminators inspect for termites and treatment is the best approach. With high ratings on Yelp, HomeAdvisor and credited by the Better Business Bureau with A+, your satisfaction is guaranteed! Some say that there are only two kinds of homes in Arizona, those that have termite problems and those that will. But is it a matter of course that you’ll have a Glendale termite control problem with your home? In just the time it takes to read this homes in Glendale are being silently attacked by insidious little wood eating creatures called termites. Before human settlements arrived in the Phoenix valley and Glendale, there were 1000’s of colonies of termites surviving on the Sonoran Desert floor. Give termites food, a water supply and some juicy wood to eat in a sheltered environment (your home! ), and they’ll swarm. With the influx of the human population, termite infestations in Glendale are all to common. The 80,000 plus households in Glendale are more than enough food for termites to live off for years. Varsity is one that really shines! Customer service was top notch! Let’s say your house has no wood or wood products., so why should you worry about termites?} It’s not that simple, unfortunately. In an ideal world, termites would only eat one variety of wood, and we could build our buildings appropriately. It would merely be a matter of reducing wood in building construction. However, termites also eat a lot other substances including: plastics, paint, silicone adhesives, paper, cloth, and carpets. While termites might or might not consume each of these materials, they have been proven to take pieces of them to build nests with. The result of an infestation of termites is ultimately wood damage. Owing to their diet, namely wood and wood products, many termite species damage buildings that are unprotected, as well damage or even destroy other wooden structures. Obviously by the time this happens, it’s already too late. It is a far better idea to get on the phone to a termite control service in Glendale and have a termite inspection done to stop the problem literally in its tracks. Because of the level of damage they can cause, termites can be a dangerous and costly pest. For example in India, termites ate the equivalent of roughly four thousand US dollars in April of 2011. Termites, like humans, favor temperate latitudes, occurring between 50 degrees north to 50 degrees south. Termites generally cause damage to thousands of homes annually. As if that weren’t bad enough, they are also major producers of methane, the second most dangerous greenhouse gas next to carbon dioxide. With all that in mind, you can see why exterminators that provide termite and pest control services in Glendale are busy. Termites can never be totally eliminated, but they can be controlled. There are several termite control products out there, but they are of dubious effectiveness. A termite inspection, however, is the only way to determine if you have a termite infestation, other than when a wooden structure collapses. So ask yourself when you’d rather find out? Before your home has been damaged is probably your best choice. We utilize some of the best termite elimination methods on the market, including Sentricon, a revolutionary baiting system that provides full colony removal. So call Varsity Termite & Pest Control, your local Glendale termite exterminator and protect both yourself and your property from becoming a statistic. 602-560-6021.